On May 1, 1913, a contract was signed by the Rev. E.J. Heilman to purchase and install a two manual water-powered Moller Pipe Organ at a cost of $2000. In 1926, a set of Deagan Chimes was installed in the organ chamber. The chimes were used for the first time at the early Easter service, when they were dedicated under the pastorate of the Rev. W.Z. Artz. On June 23, 1941, a contract was signed by the Rev. W.Z. Artz, William E. Matter, and Frank W. Paul, to purchase our present Moller Organ Opus 7026, eight rank pipe organ. Dr. Linbaugh of Susquehanna University was responsible for setting up the registration, which was far ahead of the time. Dr. Linbaugh freely gave of his time to do this for Salem. The present Moller was completed and installed in October of 1941. The cost of the organ was $3,000. Mr. Paul Kreglo, who was the Moller factory supervisor in 1982, assisted in the installation in 1941. On September 14, 1980, the organ rebuilding fund was initiated under the pastorate of the Rev. Steve Dorsett. A congregational dinner and organ recital by the Rev. Suzanne P. Perez was held. The goal of the fund was to raise $42,000 over a three year period to rebuild, re-voice, and add several new rankings to the organ. The organ was shipped to the Moller factory in Hagerstown, Maryland in June of 1982, and returned to Salem in September of that year. By this time, the necessary funds were raised, and plans were made for dedication in November, 1982. Again, the Rev. Suzanne P. Perez was invited to be the organist at the dedicatory recital. In 1991 & 1992 there were two celebrations. First, October 1991, was the 50th anniversary of the installation of the present organ. Second, October 1992, was the 10th anniversary of the rebuilding of the organ. Now, well past its 20 years after rebuilding the organ is playing wonderfully and a brilliant addition to our weekly liturgy. A pipe organ may have one or several keyboards (called manuals) played by the hands, and a pedal-board played by the feet, each of which has its own group of stops. The organ’s continuous supply of wind allows it to sustain notes for as long as the corresponding keys are depressed, unlike the piano and harpsichord, the sounds of which begin to decay once the keys are pressed. The smallest portable pipe organs may have only one or two dozen pipes and one manual; the largest may have over 20,000 pipes and seven manuals. 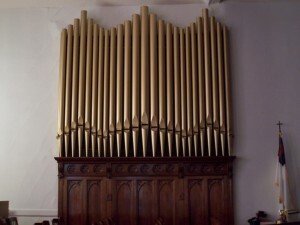 A pipe organ typically is described with an annotation indicating the number of manuals and ranks in the instrument: for example, an organ described as “IV/65” has four manuals and 65 ranks of pipes. The origins of the pipe organ can be traced back to the hydraulics in Ancient Greece in the third century BC, in which the wind supply was created with water pressure. By the sixth or seventh century AD, bellows were used to supply organs with wind. Beginning in the twelfth century, the organ began to evolve into a complex instrument capable of producing different timbres. By the seventeenth century, most of the sounds available on the modern classical organ had been developed. From that time, the pipe organ was the most complex man-made device; it retained this distinction until it was displaced by the telephone exchange in the late nineteenth century. Pipe organs are installed in churches, synagogues, concert halls, and other public buildings and are used for the performance of classical music, sacred music, and secular music. In the early twentieth century, pipe organs were installed in theaters to accompany films during the silent movie era, in municipal auditoria, where orchestral transcriptions were popular, and in the homes of the wealthy, equipped with player mechanisms. The beginning of the twenty-first century has seen a resurgence in installations in concert halls. The organ boasts a substantial repertoire, which spans over 400 years.